Android on Windows Phone smartphones ? 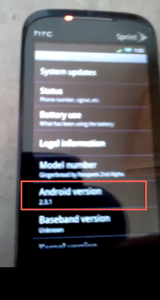 | It-11 Audio / Tonegeek"
Android on Windows Phone smartphones ? Unofficial version of Gingerbread is emerging for smartphones originally equiped with Windows Mobile. For the moment, these models of the HTC brand have this privilege : HTC Vogue Touch, Touch DiamondTouch Pro and Touch Pro 2. Still in development, you must await the finalization of builds for the smartphones in question before enjoying all the features… Unsurprisingly as Android was intended for maximum portability ! This may be first smartphones and a list could go on and integrate other devices originally sold with another OS. This entry was posted in What's up, doc ? and tagged android, htc, windows phone. Bookmark the permalink.